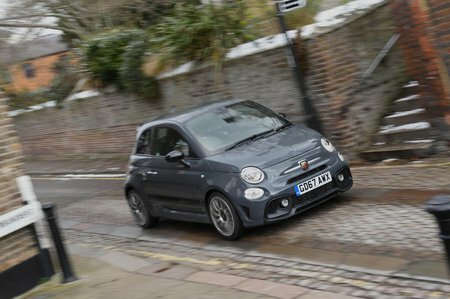 Abarth 595 1.4 T-Jet 165 Turismo 3dr Auto 2019 Review | What Car? Turismo models get more power than the standard car, better rear dampers, upgraded brakes, different wheels, rear parking sensors, climate control, leather seats and tinted rear windows. It’s well worth considering if you want more pace and luxury. Above the 595 sits the Turismo model, which produces 163bhp and 170lb ft. We have yet to try this engine, but we suspect it should be usefully more rapid than the standard car.